Military retirement pay is based on a percentage of your the base pay you received prior to retiring from active duty, or from the Guard or Reserves. 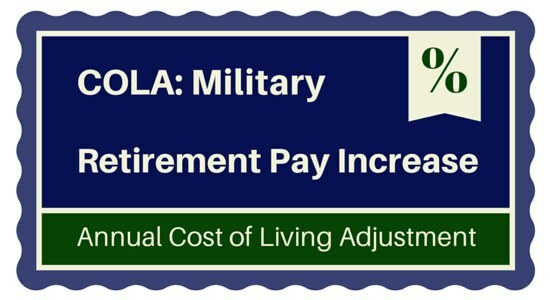 One of the benefits that makes military retirement pay so valuable is the built-in annual Cost of Living Adjustment (COLA). COLA is pegged to the Consumer Price Index (CPI), which is a formula calculated by the Bureau of Labor Statistics. In layman’s terms, it tracks inflation for the cost of certain consumer goods. 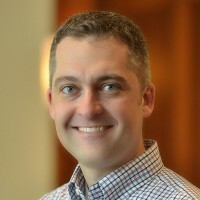 The final measurement is used for many government calculations, such as the Cost of Living Adjustment for federal pension plans (including FERS, CSRS, and military pensions), as well as COLA increases for Social Security Benefits, VA Disability Compensation, and other government benefits programs. In short, COLA is there to help your military retirement pay maintain its purchasing power over time. Related: Did you know that your military service may increase your Social Security Benefits? The Cost of Living Allowance for 2015 will be 1.7%. This is the same increase that will be applied to Social Security recipients, VA disability compensation rates, and many other recipients of government pensions and other benefits programs (verify the final numbers with the parent agency if you receive a different form of compensation). This military retirement pay COLA increase will take effect in your January 2015 payment. Note about the term COLA: The term “COLA” has different meanings, depending on the situation. In this example, we are using it as a Cost of Living Adjustment. The military also uses this term to refer to a COLA for “Cost of Living Allowance” which is an additional form of payment given to some servicemembers living in areas with a high cost of living, including overseas locations. These are different uses of the same term. Who Receives This COLA Increase? If you retired under the Final Pay or High-3 retirement plans, and you have been retired for longer than one year, you should receive the full COLA increase. If you retired in 2014 (or plan to retire in 2014), your COLA may be affected. COLA is applied on a sliding scale if you retired during the calendar year. DFAS hasn’t updated the final numbers for the 2014 retirees, so what follows are the numbers that affected military members who retired in 2013 (2014 had a 1.5% COLA increase). The numbers should be fairly similar for 2014 retirees, with the highest increase being the full 1.7% and the other COLA adjustments slightly higher. January through March retirees received the full 1.5% COLA for 2014. April through June retirees received 0.9%. July through September retirees received 0.4%. October through December retirees received no COLA in 2014. Again, the 2015 numbers should be slightly higher, based on the 1.7% COLA increase. I would expect them to be around 1.7%, 1.0%, 0.5%, and 0%, or somewhere in that range. We will update this article when DFAS makes the official announcement. (DFAS page). The reduced payment is a one-time deal, and only affects retirees following the year in which they retired. Retirees will receive the full COLA increase in subsequent years of retirement. If you signed up for the $30,000 Career Status Bonus at your 15-year mark and agreed to retire under the REDUX retirement plan, you will receive a smaller Cost of Living Adjustment each year. This is the agreement you made in exchange for receiving the $30,000 cash bonus. REDUX retirement recipients receive a COLA that is pegged at CPI – 1%. So for the 2015 increase, they would only see a 0.7% increase for the year. One-time catch-up adjustment for REDUX retirees. There is a one-time adjustment at age 62 that brings REDUX retirees’ pay up to the level it would have been without the decreased COLA. However, this is a one-time adjustment. After this increase, the annual COLA of CPI – 1% resumes. REDUX retirees in 2014. There is also a partial COLA given to military members who retired under the REDUX plan in 2014. Again, the COLA is based on the quarter in which you retired. Here are the 2013 numbers from DFAS (like the above example, we should see something very similar, if not slightly higher, for 2015). CSB recipients who retired between January 1, 2013 and June 30, 2013 received a partial COLA based on the quarter they retired. January through March retirees received 0.5% (the full 1.5% – the 1% REDUX adjustment). June – December retirees received no COLA adjustment for 2014. Like the above example, the reduced payment is a one-time deal, and only affects retirees following the year in which they retired. Retirees will receive the full COLA increase in subsequent years of retirement. How is CPI Determined: The measurement the government uses is called the Consumer Price Index for Urban Wage Earners and Clerical Workers (CPI-W), but you will often hear it simply referred to as CPI. The CPI is determined by measuring the price increases for consumer goods, such as food and beverages, housing, clothing, transportation, medical care, recreation, education, communication, and more. Chained CPI. Chained CPI is a measurement that reduces the overall CPI used today. The theory is that as the cost of some goods increase, people replace them with lower-cost goods. An example would be, as the price of steak increases, people eat less steak, and more chicken. And as the cost of gasoline increases, people will carpool, drive less frequently, or take public transportation. There are flaws in these assumptions, but that is the gist of it. Here is a full-length article on how Chained CPI can erode your purchasing power. Congress decreased Military Retirement Pay – then restored it. In early 2014, Congress agreed to cut military retirement pay, or should I say, they agreed to decrease the annual Cost of Living Adjustment similar to the REDUX option. Retirees would receive an annual COLA of (CPI – 1%), up to the age of 62, at which point they would receive a one-time adjustment to bring their pay back to the level it would have been under the full COLA method we have now. Then full COLA increases at the CPI rate would resume. This was later voted back to the current method. While these last two examples didn’t end up happening, it’s important to keep in mind that there are threats to your military retirement pay. I retired on May 28th and my RAS from yesterday indicated a 1.3% change; although I think it was pr0rated since the increase didn’t add up to 1.3%.